I hope all is well with you, here in Alberta the weather has been incredible. The sun has been shining and it has been hot. Last night we went out to a local lake and went Kayaking, the lake was like glass. I paddled over to the far side of the lake and there was a group of loons floating together, so once I got close I stopped paddling and just floated into them. There was 35 loons all together some of them were fluffing their wings on there back so I'm not sure if they had some babies tucked in there or not. It was pretty amazing and they didn't seem scared at all, I know a lot of times they will dive under the water when they are scared. I love summer, it's my favorite time of the year - there is so much to do. I have been spending a ton of time outside but how can you not when it's this nice. I have taking to walking/ jogging about 3 to 5 miles a day. It helps when I have 2 chocolate labs that encourage me to take them out. 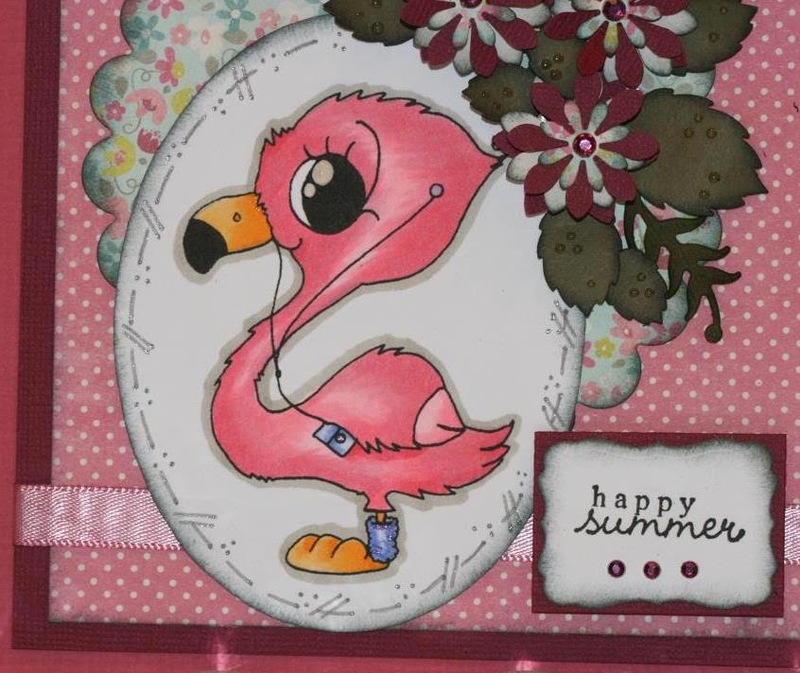 That is why I chose this adorable image from Whimsy Stamps called Workout Flamingo by designer Miss Rach. I know it's called Workout Flamingo but to me this image tells me to throw my i pod on with ear buds it's to get outside and talk my 2 dogs for a walk or to enjoy summer in my garden. Here is my creation for the Summer challenge on the Whimsy Challenge blog, I hope it inspires you to enjoy summer or an activity that you enjoy outside in some hopefully great weather. 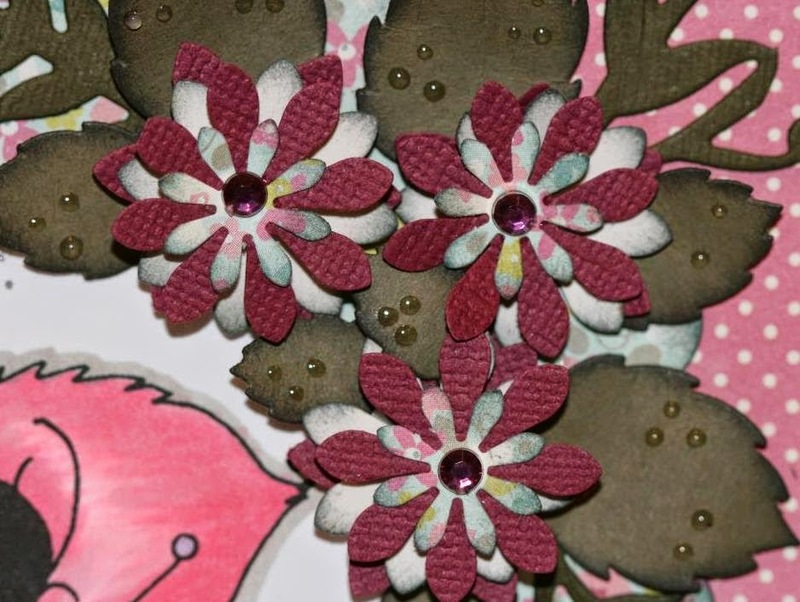 A closer look at the flowers that I put on the corner of my card, with a few dew drops on them. 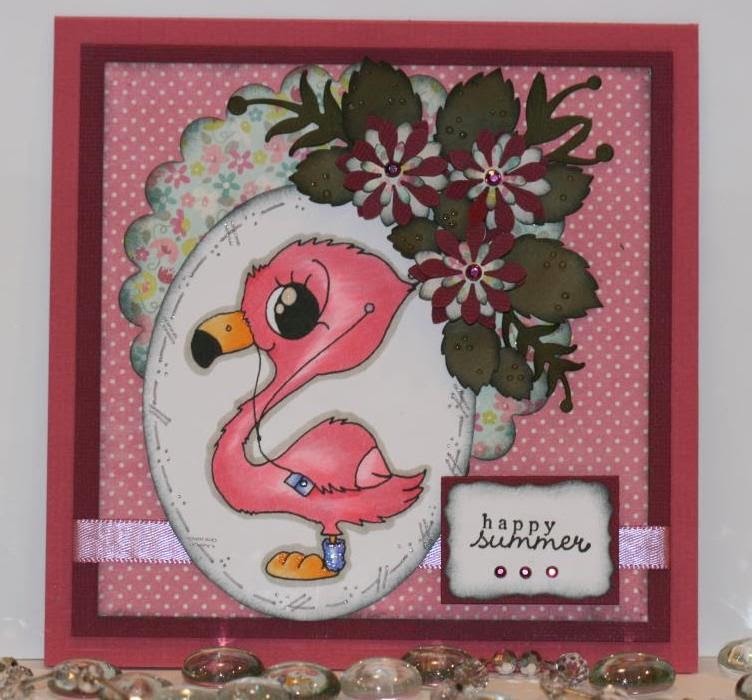 Have a fabulous day and hope to see your card on the Whimsy Challenge blog.